Today the Catholic Church celebrates the feast day of St Frances Xavier Cabrini. What makes her particularly noteworthy is that she was the first American citizen to be canonized. She came to the U.S. from Italy to become a missionary. She is the patron Saint of Immigrants and rightly so. She founded the Missionary Sisters of the Sacred Heart of Jesus and for over 35 years, the time she was here in the United States. 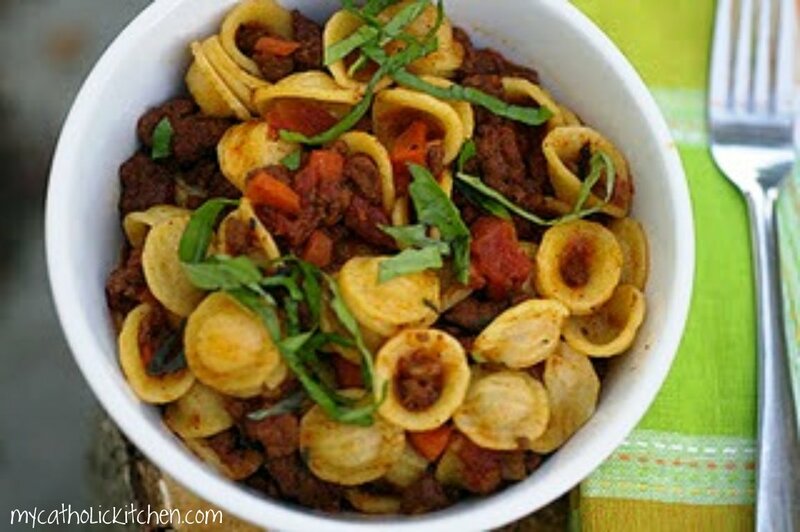 In honor of St Frances Xavier Cabrini I decided to make a Bolognese with Orecchietti. 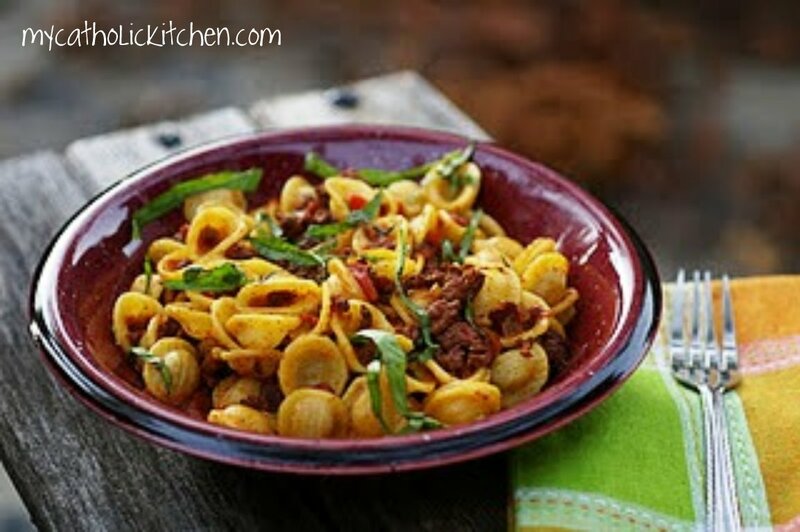 Did you know that Orecchietti means little ears in Italian? In a large frying pan warm the oil and add the bacon. Saute until it begins to render its fat about 1 minute. Add the onions, carrots and celery and saute until the onions are soft. Add the beef and cook the meat until it is is no longer pink about 10 minutes. Transfer to a slow cooker. Add the broth and wine to the pan and bring the heat up to high. Deglaze the pan and pour the liquid into the slow cooker along with the tomatoes. Stir everything together. Cover and cook the sauce on the high-heat setting for 4 hours or the low-heat setting for 8 hours. Add the milk to combine and continue cooking another 20 minutes. Season with salt and pepper. Bring a large pot of water to a boil. Add 2 tablespoons salt and the pasta. Cook stirring occasionally until Al Dente. Drain, add to pot and toss with the sauce. Serve with Parmesan on the side.